In the context of a collaboration with USAID Feed the Future, the CSA Programming and Indicator Tool has been designed to contribute to address both the need of good instruments for programming, and better metrics for tracking outcomes and impact, and to allow multiple development agencies and agricultural focused programs to share a common framework on how they are currently addressing climate-smart agriculture (CSA), and how they can make their future programming process more climate-smart. support the identification and selection of an appropriate set of indicators to measure and track CSA outcomes. increase awareness on how to ‘make’ their future interventions' planning process climate-smart. 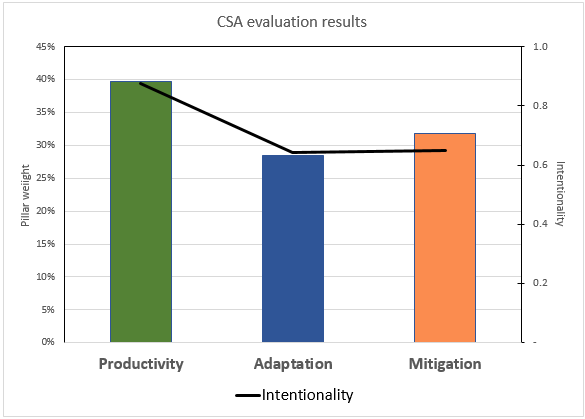 Supported by a database of over 378 indicators with CSA-related indicators gathered from several international development agencies/ institutions (FAO, DFID, GIZ, IFAD-ASAP, World Bank, USAID and CCAFS), this tool will facilitate the delivery of not only productivity outcomes, but also positively tracking adaptation and mitigation impacts. The user is invited to respond to specific questions related to the three CSA pillars. A traffic light system allows to specify the degree of intentionality desired (red: not at all, amber: indirectly and green: directly). The main objective is to enable users to more systematically check for potential co-benefits and/or unintended outcomes (in more than one pillar), and thus properly identify appropriate indicators and metrics for its M&E. Step 3a: Results summary. 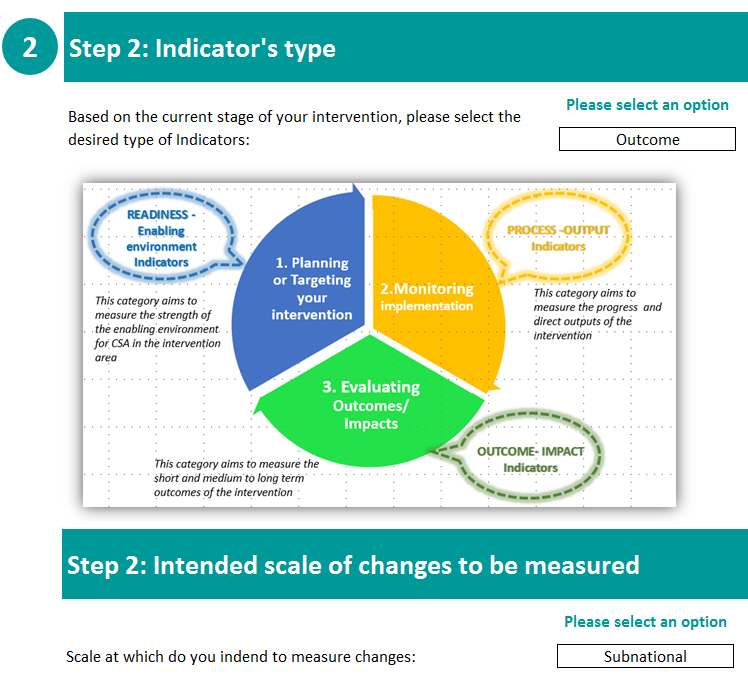 This step leads to a proposed set of relevant indicators that can be used and their closeness of fit to inform the design and M&E plan of future interventions. Step 3b: Visualization. This step includes the intervention's evaluation through CSA lens and degree of intentionality. This step-by-step tool should serve as a guide tailored to the needs and capacity of each agency/practitioner. This CSA programming and Indicator Tool is an evolving prototype product until a critical mass of users has trialed the instrument and provided feedback on how it can be improved. Updates will be published in this website as the Tool evolves and new versions are developed. Should you use it, please share your comments with us at o.bonilla@cgiar.org. Specific relevance rating was also (subjectively) assessed to help users identify most appropriate indicators from a long list. Indicators relating to income and poverty were classed under productivity; indicators that did not directly relate to a CSA pillar, such as health and nutrition, were not included. Some indicators were edited to be more in line with CSA outcomes and 85 “new” indicators were created. The emphasis on quantitative indicators is clear. 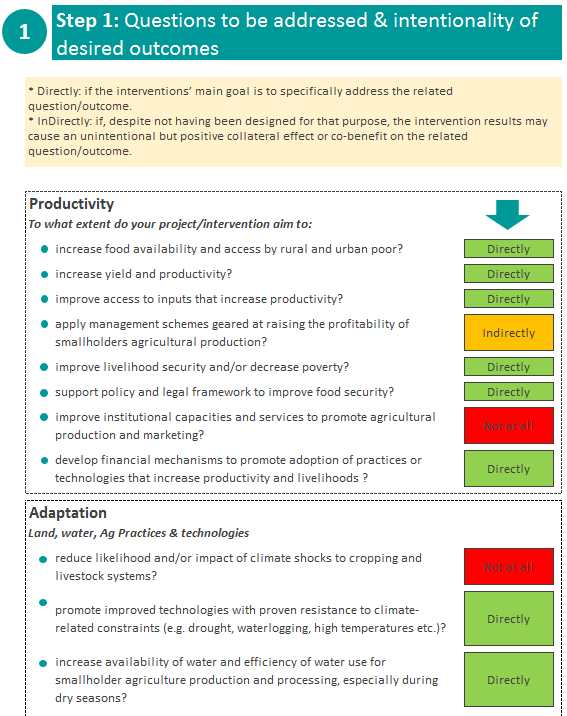 Significant lack of indicators relating to mitigation outcomes; most common indicators are related to productivity. Among the indicators related to the productivity pillar there is an emphasis on yields, income and livelihood security, with an evident gap on indicators related to: support policy and legal framework to improve food security and food availability and access. Adaptation indicators are largely geared towards risk management, technologies, information and enabling environment. There are very few indicators specifically address seed varieties, crop insurance and financial indicators geared towards the adoption of CSA technologies and practices. Generally, indicators lacked the ability to show a change over time, or to measure specific changes in low/lean season (increase on-farm production and/or livelihoods) and. Hills T, Pramova E, Neufeldt H, Ericksen P, Thornton P, Noble A, Weight E, Campbell B, McCartney M. 2015. A Monitoring Instrument for Resilience. CCAFS Working Paper no. 96. Copenhagen, Denmark: CGIAR Research Program on Climate Change, Agriculture and Food Security (CCAFS). 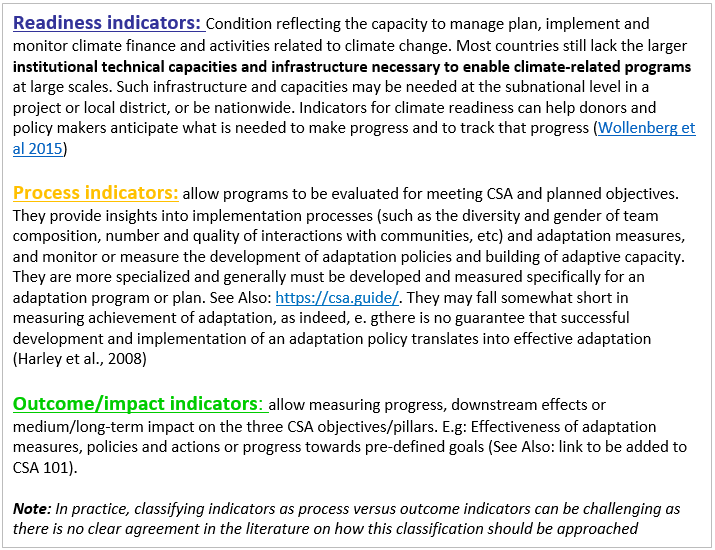 Climate change adaptation indicators list . In addition to CCAFS Donors, the U.S. Agency for International Development (USAID) supported the publication of the Tool on this page. The opinions expressed herein are those of the author(s) and do not necessarily reflect the views of USAID.